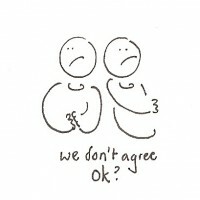 Home » Conversation » Agreeing / Disagreeing—How to agree/disagree with what someone has said. I’m afraid I don’t /can’t agree with you there. I have to say, I disagree with you there. I take a (slightly) different view on this. I don’t know. I tend to think that the opposite is true. A : Money spent on training is always a good investment. B : I’m not sure about that. I think it depends on the quality of training. I’m sorry but I just don’t think it’s a good idea.